Contributed by former Hook Heath resident Clare Reeves (nee Handover). I lived in Hook Heath from 1957 until 1969 – my teenage years. We lived in the first house on the left when entering Cedar Road from Hook Heath Road, not the corner house. My parents called it St. Cross after an area in Winchester; goodness knows why - we had no connection with Winchester! I know the house name has been changed but I do not know the current name. I am attaching the only two photographs I have of the house. These would have been taken quite soon after we moved in in January 1957 as my father removed the windows on the right-hand side and put in French Doors onto a patio area (don't think we called it a patio in those times!). 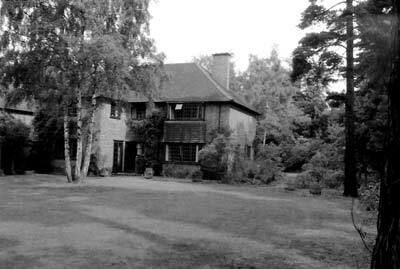 The house I believed cost £5,000 and when sold in 1969 it went for around £14,000. During the time we lived there Allen House School still had playing fields half way down Cedar Road on the right-hand side where they subsequently built five or six houses set back from the road on their own access road. The composer Les Reed lived in a house he named 'The Hook' at the bottom on the right hand side. I went to school in Pyrford and before being old enough to cycle travelled home by bus, and for some unknown reason I remember it being the No.63. The fare was 2d from Woking Station to the Star or 2 1/2d to go the extra stop to the top of Cedar Road. If I got off at the Star I was allowed to keep the halfpenny, and I had a particular liking for aniseed balls. Oh, those were the days! At the end of the Pine Road there used to be letter box. The little disc at the top giving the time of the next collection. I remember this was incorrect and some poor postman used to put a sticky label over the top with the correct time - along I came with itchy fingers and I used to repeatedly peel it off!! During one school holiday I worked in a children’s home called Aigburth that was along Mile Path; about two-thirds of the way up on the left – no doubt long since closed. 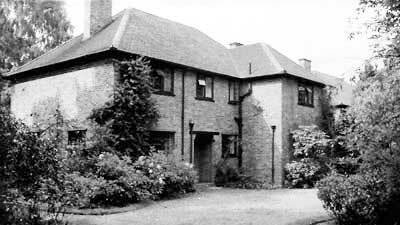 It was a large rambling house even in the context of Hook Heath. My mother was a stalwart of the local Mayford WI; and my father held several positions in the Woking Photographic Society. All a long, long time ago, but I hold very fond memories of the walk along Hook Heath Road to the bus stop outside the general stores near the Star Inn and I bought my very first car, a Fiat 500, at the garage opposite for the princely sum of £150.00. There was a small number of shops down the hill from the Star, the first one was what would now be referred to as a delicatessen and the owner had been injured during the First World War and had very bad eyesight. I cannot remember the purposes of the other stores apart from the last one, beside a lane, which was a glory hole of an ironmongers much like the one in the Two Ronnie's sketch of 'four candles'. Opposite this parade of shops was a milliners, no doubt long since gone. Now I live on the outskirts of Bristol. I did have occasion to travel through Woking a few years ago and apart from the immediate environs of the station it was totally foreign to me. One day before too long hopefully I shall retrace my steps.